Welcome to The Final Ride, We are Central Queenslands very own Harley Hearse. The Final Ride is designed to work in conjunction with your own Funeral Director to provide a service befitting of one who has lived with two wheels. Our Harley Hearse will transport the departed from the Funeral home to the service and then to their final resting place. A guard of honour of fellow riders would help celebrate their life. The seating on this Harley also allows for the partner, if they wish, to ride along side the deceased during the final ride. The Final Ride offer our services to non biker families, for those who would just like something a little different with their funeral. To those who have never heard of the Final Ride we are a business that was established in 2009 with the Harley Hearse so that bikers could "go out with dignity" of recent we have grown with the purchase of two more hearses, we work very close with the family of the departed to provide a personal and unique service, the final ride works in conjunction with your funeral director and helps to create a memorable celebration of the departed’s life, please contact us if we can be of any assistance. It is our belief that we can offer an alternative to the standard funeral service with the addition one of our hearses, each hearse has been chosen to suit a wide demographic of groups and each page will show what alternatives there are. 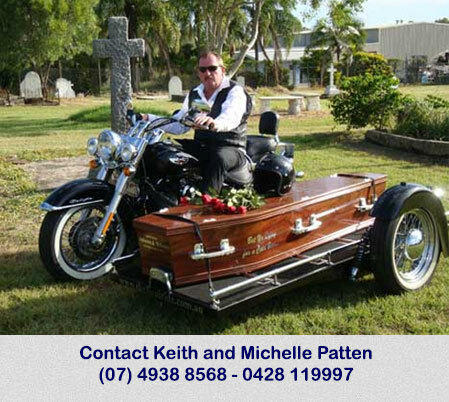 Keith (Preacher) is a well-known funeral celebrant in the biker community but his services are easily transformed to suit other needs, his services are prepared with close consultation with the family and are designed to celebrate the life of the departed and make the passing of a loved one a little easier for all who are mourning. The Final Ride Pty Ltd is committed to customer service and our professional team are more than happy to discuss you personal requirements. To ensure that your final wishes are implemented saving your family the emotional strain of decision making. Prearranging is a cost effective way of hedging against higher future costs, saving your family and financial burdoned at the time of decision making. Per-need funds are safely held in trust accounts and governed by trust regulations schedule of fees and charges. Or contact your funeral director and request your interest in our service.